Ducker Research predicts that use of advanced high-strength steels (AHSS) for automotive body and closure applications will nearly double by 2025. These higher yield- and tensile-strength steels allow automakers to maintain structural integrity while using a lighter-gauge material to reduce weight. However, processing AHSS grades continues to challenge stampers, including how to feed them into presses. 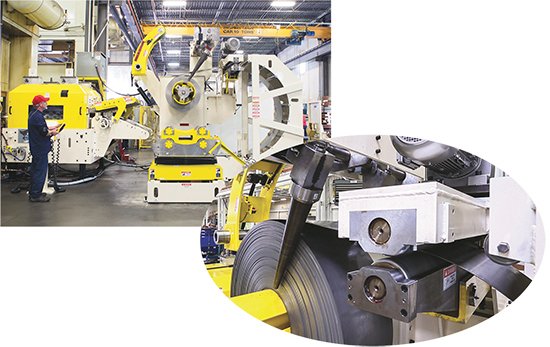 Nahanni Steel Products’ new compact coil line (a Coe SpaceMaster Series 4) unwinds, straightens and feeds coil stock in yield strengths to 1000 MPa at speeds to 60-70 strokes/min, within 23 ft. of floor space. Key to the design is its unique approach to pilot release. Shown in the insert photo: Powered coil guides that feature a tapered roll design for effective coil guiding of higher-yield materials. To overcome these issues, Nahanni began looking to invest in technology to help improve safety, processing times and quality, and reduce setup times, all while reducing the footprint required for manufacturing. In particular, Nahanni had been experiencing difficulty in obtaining the required material flatness prior to feeding the press. In addition to the common coil-set issues, it also consistently experienced crossbow issues—where the material is curved across the width of the coil. Nahanni next laid out its requirement wish list, which included a solution that could run a broad range of materials, material thicknesses (0.030 to 0.300 in. ), and increased material strengths; optimize floor space; and enable simple and safe threading. To optimize slack-loop storage and maximize feed speed (the coil line can support press speed to 70 strokes/min. ), the coil line employs lasers to track material location. Starting with the capabilities of the advanced HD-straightener head, the Coe engineering team continued to design the rest of the solution from the ground up, developing several new concepts. 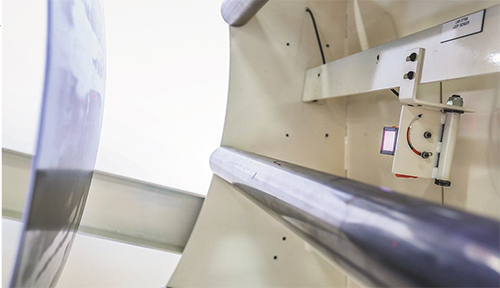 Engineers verified design feasibility with solid modeling, unique spreadsheet calculations and finite-element analysis, ensuring that the machine would have the right structures in the right places. Ultimately, Nahanni Steel Products welcomed, in September 2015, a new coil line (Coe’s new SpaceMaster Series 4 compact coil line) that unwinds, straightens and feeds coil stock in yield strengths to 1000 MPa at speeds to 60-70 strokes/min, within 23 ft. of floor space. Key to the design is a unique approach to pilot release—the act of momentarily releasing the strip to allow it to be aligned by pilot pins in the die. This momentary release relieves built-up stress and binding of the strip through the feed and die, caused by feed-length variation, misalignment and coil camber. The servo-driven feeder-straightener has 4-in.-dia. straightening rolls and 6.3-in.-dia. pinch rolls, selected for processing heavy-gauge and high-strength materials. The small straightener rollers provide a small radius around which to bend the material to accommodate AHSS, which needs to be bent more severely in order to exceed its high yield point. Another unique feature of the new line is a pivoting pull-off roll assembly. This allows tension to be maintained on the coil to prevent clock-springing, and it enables higher line speeds for the compact coil-line process. Additionally, the roll system is self-leveling to accommodate a wide range of material thicknesses. Describing the benefits Nahanni has realized with its new coil line, Zupanec notes significantly reduced coil changeover time, improving efficiencies. Coil handling and safety also have been improved, he says, with reduced trial-and-error times to meet required specifications that had previously challenged the company. And, whereas press rate once exceeded feed-line capability, the new line promises to help improve throughput.